The Piaggio MP3 500 ABS, with aggressive styling and performance, is the three-wheeler for people who want to stand out. Riding has never been this easy, enjoyable, secure and fast. When you take 20% less braking distance required and pair it with a lean angle of 40-degrees, you get a perfect machine for impeccable road holding in all riding conditions. GREATER SAFETY VIA ABS AND ASR TRACTION CONTROL, MORE COMFORT FOR RIDER AND PASSENGER, MORE SPACE, UTMOST TECHNOLOGY ON BOARD AND A HIGH-PERFORMANCE ENGINE WITH REDUCED CONSUMPTION. In 2006 Piaggio brought the future to today inventing a new form of transport. With Mp3, Piaggio reinvented city transport. Piaggio Mp3 was the world’s first 3-wheel scooter, the concrete response to the demand for easy-to-handle, extremely safe city vehicles to get about in the city or reach the city centre from the ever growing suburbs. The two front wheels and the exclusive patented suspension system joining them combine the safety of a car with the simplicity and practicality of a scooter and the fun of a motor cycle with dynamic riding when turning. Therefore Piaggio Mp3 is able to satisfy a truly global demand: from drivers looking for a more practical yet safe alternative to the experienced motorcyclist able to appreciate the advantages and technical features of a vehicle that has, on its own, created a new market segment of which it is the undisputed leader. 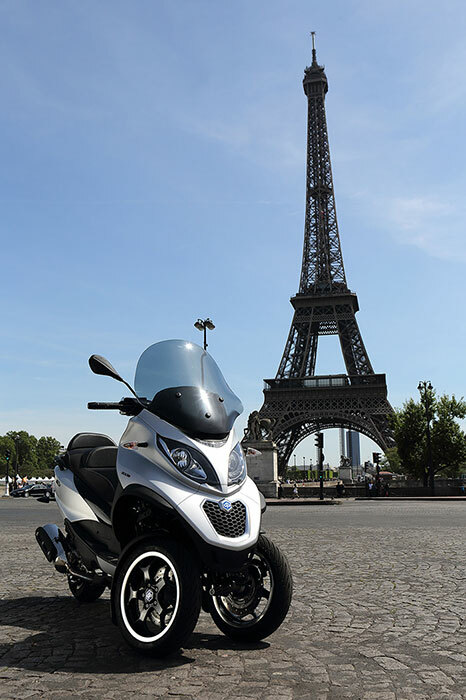 Piaggio Mp3 500, the current flagship of the three-wheeler vehicle range offered by the Piaggio Group, is available in two versions, Business and Sport, able to satisfy every need of urban, metropolitan and out-of-town mobility and can be ridden with a normal car driving license. The chassis of the Piaggio MP3 has been designed with the dual objective of, on the one hand, ensuring excellent stability and riding precision and, on the other, increasing vehicle usability, obtaining the best Piaggio Mp3 ever built in terms of dynamic qualities, safety standards and rider and passenger comfort. The space available improves ergonomics and optimizes the use of the load space in the under seat compartment. The shapes and forms help to increase on-board comfort. The saddle is of lavish dimensions: flat and comfortable also for two people. with ergonomic benefits, starting from the position of the legs, more extended and relaxed. In particular the handlebars-saddle-footplate triangulation is larger, making riding easier and improving vehicle control. And it’s not only the rider who benefits. Conceived as an alternative to the car, the Piaggio Mp3 also provides additional passenger comfort: with increased space, and a more relaxed sitting position, plus the advantages of a pull-out footplate. The large compartment under the seat, fitted with 12 volt plug, courtesy light and mat, has been redesigned for additional uses, due to the regular, almost rectangular shape, without indentations or partitions, so every square centimetre can be used, for example to store two flip up helmets or a laptop holder. As before the seat opens electrically with power-assisted shock absorber for smooth, safe opening. The flat streamlined tail fairing for an easily assembled box (just one of the many accessories available), further increasing the already exceptional load capacity of the Piaggio Mp3. Piaggio Mp3 has been the first 3-wheeled scooter. Today the Piaggio MP3 is confirmed as the absolute benchmark in terms of safety, thanks to the ABS anti-lock braking system supplemented by ASR (Acceleration Slip Regulation) traction control. The ABS system maximizes active safety preventing wheel blockage under braking and providing full control of the vehicle at all times. Developed specifically for the Piaggio Mp3, it uses a Continental control unit and three channels controlling the three wheels individually modulating only the braking force to prevent grip loss. The Piaggio Mp3 adopts disc brakes on all three wheels, with 258 mm front discs, helping to increase their power and efficiency and reducing stopping distances. Excellent safety and ability to absorb road roughness is provided by the 13-inch front wheels. 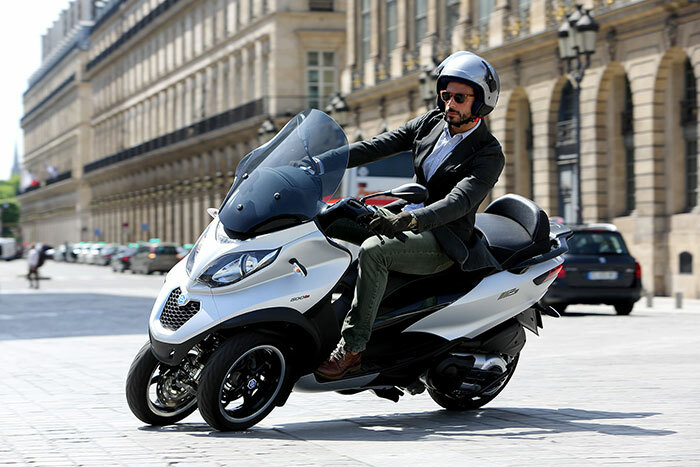 The style of the Piaggio Mp3 500 has clear references to the car world, which it closely resembles for the refinement of the finishes and the high level of perceived quality. The Centro Stile Piaggio Group has characterised it with distinctive modern and very personal features. The front shield is supplemented by the protective tinted windshield, height adjustable in three positions. The headlights and indicators consist of high efficiency daytime lights with 7 LEDs, adapted from the auto industry and modernizing the look of the front of the scooter. The 13″ wheel rims boast an elegant 5 split spoke design: reminiscent of saloon cars and luxury autos. The handlebars integrate with the complete set of modern instruments in two conventional round panels and a multi-purpose digital panel with data on fuel consumption (average and current), average and maximum speed, fuel gauge, travel time, ambient temperature and ice alarm. The instrument panel also includes a clock, dual mapping of the engine CPU, total and trip counter and battery voltage reader. The 11 lights on the instrument panel display the functioning of the headlights, dipped headlights, indicators, reserve fuel, oil pressure, warning (injection), immobilizer, ABS, ASR and four emergency lights. In the centre part, just beneath the display, a series of 4 warning lights are placed which indicate: roll lock warning, engine shut-down, no roll and hand brake. Push buttons under the handlebars are to open the saddle and switch off the ASR. The attention to detail is also noticeable in the leg shield back plate that adopts two padded shock-resistant elements matching the saddle colour, right in front of the rider’s knees. Complete with pull-out hook for bags. The compartment above the instruments has a drawer and USB connection, ideal for recharging a smartphone and other devices. 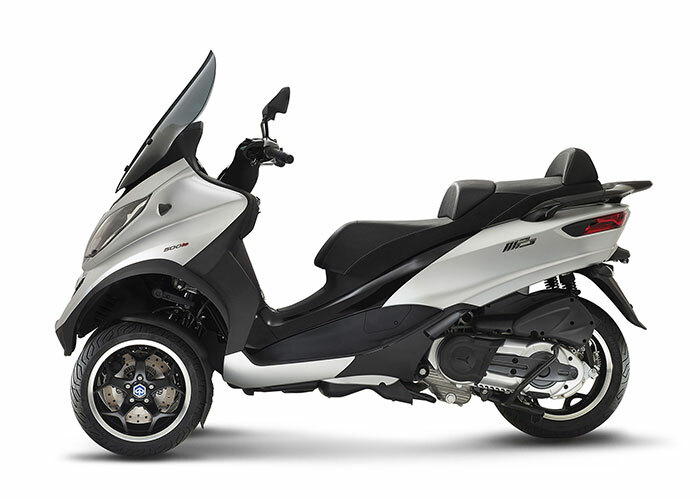 The rear of the Piaggio MP3 is modern, sporty and elegant at the same time. The line was inspired by the latest generation of Piaggio GT maxi-scooters. The truncated tail is streamlined and dynamic and accommodates the stop and tail lights implemented using LED technology, highlighting the sports character of the Piaggio Mp3, reflected in its exceptional road holding and tilt while turning. Passenger comfort is ensured by the saddle, exceptionally comfortable. and by the ergonomic aluminium handle integrated in the luggage rack. 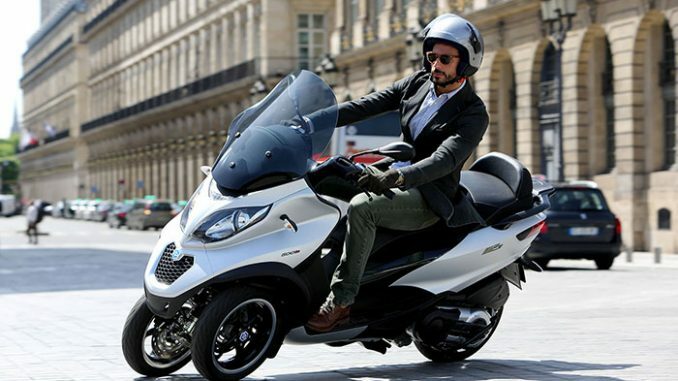 The new Piaggio MP3 – the ideal commuter scooter debuts in the 500cc version with powerful yet highly economical engine. Because of its three-wheeled design it’s actually classed as a tricycle, and can therefore be ridden on any road, with a standard car licence. It is the first ‘three-wheeler’ in the world to boast an anti-lock braking system (ABS) integrated with ASR traction control (Acceleration Slip Regulation) – A Piaggio Group exclusive and technological first in this category. The two front wheels are larger in diameter – now 13 inches – with a new design which benefits both the dynamic handling and the more dynamic look of the MP3’s front end, which has become even more prominent. The new 500cc engine adopts the ‘ride-by-wire’ engine control system that gives the rider the option to switch between two maps – ‘’standard’’ and ‘’eco’’. Fuel consumption is down by 15% on the standard map and a further 10% on the eco, making this vehicle up to 25% more fuel efficient. This new model also boasts PMP* (Piaggio Multimedia Platform) allowing you to connect through a Bluetooth, iOS or Android smartphone, in order to open up new and different functions including average fuel consumption and navigation to your nearest authorised service centre. *PMP (Piaggio Multimedia Platform) is optional and only available as an accessory. 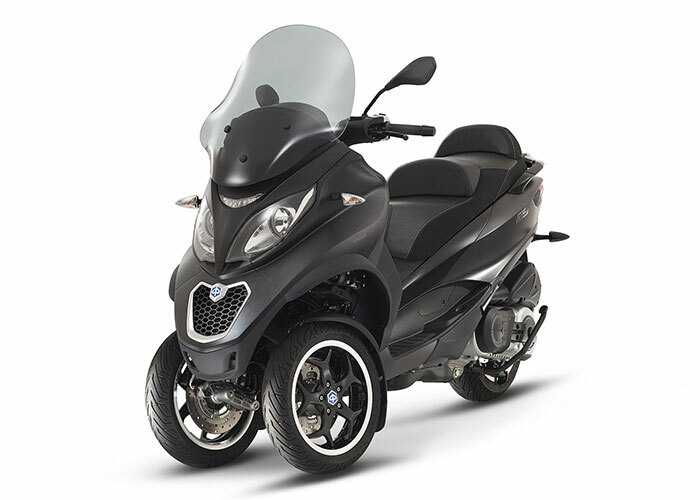 Since its launch the Piaggio Mp3 has always provided top motoring performance in absolute safety through its exclusive dual front-wheel technology. A combination of 3-wheeler and high-performance engine which gives the Piaggio Mp3 its undisguised sports character and cornering fun nipping through city streets and sweeping round country roads. The 500cc engine – an example of robustness and reliability that is at the top of the range of high performance scooter engines – is a concentration of technology. 4-valve, liquid-cooled with electronic fuel injection, it is the most powerful engine in its class, and is fitted with a multimap “Ride-by-Wire” electronic acceleration system which improves the power supply and hence the rideability of the Piaggio Mp3, allowing the rider to choose between optimum performance and fuel saving by changing the engine mapping via a pushbutton on the handlebar. The result is a great fluidity of engine operation at low revs. This is due to the single-shaft timing system which uses roller tappets and optimizes the timing diagram to reduce mechanical noise and improve reliability. The intake line is calibrated for an optimum air/fuel ratio (filling coefficient). The duct improves the torque at low revs, guaranteeing an exceptionally smooth ride at all revs, and reducing fuel consumption. The exhaust system layout has been designed to reduce noise and make the sound more harmonic. Finally, the setting of the CVT gearbox also helps to reduce fuel consumption and mechanical noise, ensuring smoother starts through a more gradual clutch. The sophisticated Piaggio Multimedia Platform, available from among the many dedicated accessories for the Piaggio Mp3, illustrated in the catalogue, connects your smartphone to the on-board electronic system, turning it into a multi-purpose instrument, a computer able to display simultaneously data such as speed, revs, engine power and torque in real time, as well as acceleration in a straight line, tilt in cornering, average and current fuel consumption, average speed and battery voltage among a host of other functions. A smartphone connected with the Piaggio Multimedia Platform can also be used to display maps and routes or to find the location, for example, of petrol stations or support services. The tyre status control function (only available for Mp3 500 equipped with the ABS/ASR) synergically exploits the vehicle’s sensors and the iPhone to monitor tyre wear and air, warning the user before any potentially critical situations arise; the function of general analysis shows the overall vehicle status. Piaggio Mp3 It is available in the Business and Sport versions, characterised by dedicated configurations colour range. The Business version, elegant and city-friendly, characterized by a “Business”plate on the rear part of the tail, distinguishes itself through some prestige details, such as the chrome-plated exhaust pipe, the saddle with dual lining, dedicated rear-view mirrors and the finish in gunmetal grey of the central tunnel, the handlebars and the passenger handles. The elegance of Piaggio Mp3 500 Business is highlighted by the two chrome-plated versions available: Bianco Iceberg, Nero Universo and Marrone Mercurio. 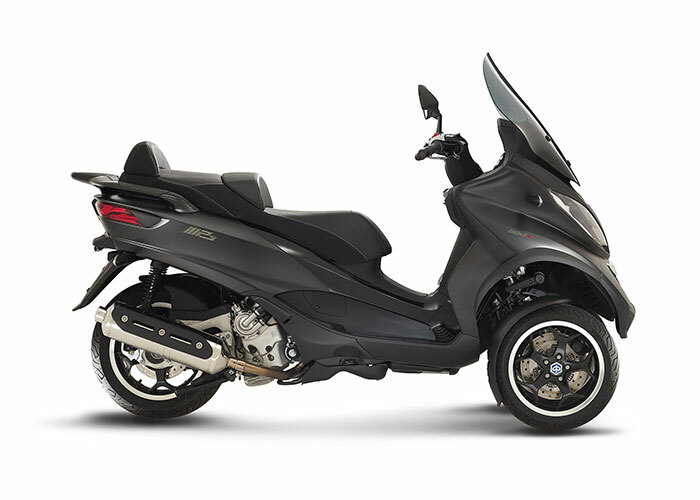 The Sport version of Piaggio Mp3 500 is distinguished by the “Sport”plate on the rear of the tail and the numerous items with shiny black finish, such as the protection of the end of the exhaust pipe, the passenger handles, the handlebars and moulding of the central tunnel. The black saddle of the Sport version has a lining in two different materials. There are three dedicated colour schemes for the Sport version of the new Piaggio Mp3 500: Nero Carbonio, Argento Cometa and Grigio Titanio. To enhance the role of the metropolitan three-wheeler commuter, a wide range of accessories is available. The large rear top box, which can be unhooked rapidly, with 50 litre capacity, can house two full-face helmets. The upper shield is painted the same colour as the vehicle and has a comfortable backrest to make the passenger’s ride more enjoyable. Also available is the set of semi-rigid panniers with quick release system, to allow maximum load with minimum encumbrance. In addition the leg-covering fabric, an increasingly important accessory for commuters whatever the season and irrespective of the weather conditions, was designed to provide maximum warmth and protection against the rain on the new Mp3. The fabric is designed for the vehicle and for perfect safety, and is stable even at high speeds. The leg cover is predisposed for the heating module that, together with heated grips, significantly improves driving comfort in the colder months. The rider is also protected by a further function of the Piaggio Mp3: thermal and waterproof protection for the hands, the Tunnel Bag, placed simply behind the leg shield back plate, electronic anti-theft systems and the Comfort Gel saddle, which has gel inserts under the lining to provide maximum comfort to the rider and passenger. With the Mp3 a new range of helmets is available, with hi-tech design, providing safety, comfort and maximum protection. Articulated quadrilateral consisting of four aluminum arms sustaining two steering tubes, and leading arm suspension geometry with offset wheel axle. Stroke: 95mm. Electro-hydraulic suspension locking system.